Fresh thoughts….as stimulated by The Handbook of Design for Sustainability, Stuart Walker and Jacques Giard. eds. (2013) Bloomsbury. As John Thackara notes in the forward to this 550 page tome, this collection of writing gives an historical and theoretical reflection on how we can approach and practice design for sustainability. It also combines fresh perspectives on what is coming, or might come, next. The 32 essays have been sourced worldwide from diverse academics, many with a long-standing research experience, critique and know-how of the application of design to sustainability issues. These decades of experience are brought together under the capable guidance of contributing editors Stuart Walker and Jacques Giard under four sections: ‘Historical and Theoretical Perspectives; Methods and Approaches; Sustainability in Practice’; and ‘Emerging Directions and Sustainable Futures’, the latter being the most extensive collection of essays – indicating that design for sustainability, as a field, continues to evolve. Rather than reviewing the whole book, I shall pick out some insights from the authors in the section, ‘Emerging Directions and Sustainable Futures’, pp315-528, that have stimulated and provoked my own thinking. [My own reflections are presented in Italics within square parentheses]. Tony Fry, ‘Emerging Directions’, pp513-522, argues that to (re)direct our practice we need to address how we ‘think in time’. This loops back to his earlier work on de-futuring, the notion that we are making (design) decisions that effectively remove options for future generations. Implicit in this future-orientation is the need to (significantly) change our design methods and approaches – a theme picked up by John Wood in his chapter, ‘Meta-Designing Paradigm Change: An Ecomimetic, Language-Centred Approach’, pp428-445. Wood notes that design employs methods to develop products and services, rather than to change human behaviour itself. For this (huge) task he feels that meta-design, a combination and synthesis of strategies and practices to create novel synergies, is more appropriate. This requires a ‘re-languaging’ strategy, because language is embedded in (accepted) paradigms in ‘a cluster of adjacent meanings and signs that constitute the structure, rather than content, of what is said’ (after de Saussure). Wood develops this theme with an example; the early mass-produced automobile can be mapped to ‘codependent affinities’, such as commuter belts/housing estates, out-of-town/ supermarkets and roads/taxation (after Maturana and Varela’s ‘structural coupling’). Wood’s discourse later invokes the word ‘sympoiesis’, a profound co-authorship which maintains symbiotic relations. [My thoughts go to some of the existing and potential collaborations happening in the cross-overs between craftivism, hactivism, and the maker and open source movements (for example, in the world of open source knitting) and wonder if this is a kind of meta-design practice?] Wood also picks up on the lack of binary division between the living and non-living (inanimate) in Gaia theory as an acknowledgement of the importance of diversity of forms or conditions as essential to re-languaging and evolution itself. [I would add that these ways of thinking are also wonderfully communicated in Jane Bennett’s Vibrant Matter, which makes a significant contribution to the sustainability oeuvre]. Non-binary ways of perceiving help us to imagine more shareable ‘futures’ by re-connecting or co-creating different codependent affinities. Chris Ryan, ‘Critical Agendas: Designing for Sustainability from Products to Systems’, pp408-427, talks about ‘post-carbonaceous transition’ and suggests that it requires the ‘progressive development of a physical and structural world that provides for an immersive re-connection with natural ecosystems’. This transition has to confront our embedded physical and cultural dependence on fossil fuels involving ‘historically constituted relationships to the weather, science, economic growth, and the structures of power’. These relationships have dangerously disconnected us from empathy with and knowledge of natural systems. Ryan recalls two critical features of resilient ecosystems, ‘response diversity’, the ways species and organisms react to a shock, and ‘ecological memory’ is the processes of renewal that permit recovery even when whole populations are destroyed. He suggests that a distributed systems biomimicry, and its implicit redistribution of (human) power (structures) to more polycentric governance, would enable us to build resilience to ensure the future supply of goods, services and infrastructures. Ryan, as Wood, is suggesting a substantive reconfiguration of socio-political and socio-cultural relationships. Both suggest that design has something to contribute to experimenting with new relationships. Knowles, Walker and Blair, ‘Design for Cyber-Sustainability: Toward a Sustainable Digital Future’, pp488-512, deal with an important, but often ignored, dimension of the sustainability challenge, cyber-sustainability. This is contextualised as embracing more than the physical infrastructure of the Internet or Web, but also the environmental, social, economic and spiritual issues of cyberspace, and consequently goes beyond the material metaphysic to involve ethics and personal, inner growth. The authors refer to critics of Web technologies who point out that the social and spiritual issues are subsumed in order to deal with instrumental needs. Much of the near-future Web developments are already ‘locked in’ and cyberspace is a ‘node in a highly integrated’…‘constellation of meaning’. [These descriptions seem to echo Wood’s ‘codependent affinities’ and Ryan’s ‘constituted relationships’]. Through a series of complex ‘antipattern’ scenarios (Cyberspace is infinite; Humans are inferior machines; Technology is neutral; and The Web is invincible) the authors demonstrate that the Web, with its conferred mythic status and in its current incarnation, is actually vulnerable and unsustainable from multi-dimensions. They conclude that the Web as it exists is only ‘one possible use of the massive potential that is cyberspace’, because if we choose to look at cyberspace as a means to expand human potential it could develop differently and more sustainably. [This stimulated me to think that analysing the Web through the lens of the designCapitalia framework would be a way of evolving different scenarios. The framework names 32 different types of capital including various forms of human capital, such as spiritual capital]. Reflecting on my own contribution to the book, Design Activism: Challenging the Paradigm by Dissensus, Consensus, and Transitional Practices, pp466-487, the design activists are disturbing existing relationships and experimenting with new combinations of relationships which challenge codependent affinities, constituted relationships, and locked in constellations of meaning. I see a range of typical design approaches and orientations (consensus, dissensus or a mixture of these) that are being directed towards changing our capabilities, as expressed through human, social and cultural capital. These actions happen in the space of flows and the space of places (after Castells) and a new space I called the space of concepts. All this (activist) activity is about applying design in a way that has a ‘lucid critical consciousness (both sociological and ecological)’ (after Maldonado). [My further reflection, given my colleagues contributions above, is that these activities need to generate new concepts as new language that re-establishes meaningful relationships which implicitly embed sustainability, or they will not affect positive change]. 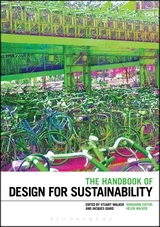 There’s a wealth of knowledge presented in The Handbook of Design for Sustainability, but, taking the long-view, it seems that we are still in the first few child-like steps of the sustainability journey, searching for the language to create new, resonant cultural meaning to set the old affinities, dependencies and assumptions behind us. However, I warmly recommend this book for anyone who wishes to re-invigorate their thinking, take new (sustainable) actions and develop fresh, culturally attractive concepts.